And what else should pet owners know about trapping? One aspect of trapping is that it can be a satisfying pastime, and a source of income. When a trapper wants to catch an animal of a given species and maturity (e.g. a mature raccoon, bobcat, fisher, coyote, or other wild animal), he makes a "set" for the trap that he thinks will be attractive to the animal. For some types of animal, he'll put the trap in a box or "cubby," or another structure that looks like the nest of a prey animal. For others, the trap will be set just off of a trail. Some animals will be attracted by the sight of what looks like prey activity, or even human activity that they've learned to associate with food. Some will respond from a distance to particular scents--many to the smell of rotting meat. Some will climb to follow the scent, others will swim, and yet others will dig. When the trapper makes the set skillfully, and specifically for the animal he wants to catch, his chances of catching that animal increase. Trappers know a lot, and they like to use that knowledge, keep their hands and minds busy, and spend as much time as possible outdoors. They like the look of fur--on the animal, or on a well-made winter coat. Just like their fathers, and their fathers' fathers, they think of trapping as a long and honorable tradition. Another aspect of trapping is that it can do a lot of harm. Even when a trapper makes a good set, though, there's a chance he'll catch and injure or kill a "non-target" animal--in other words, the wrong animal. Depending on the geographical area, the season, the weather, and the events of the day, the probability of a "non-target catch" can be dangerously high. Every dog lover has known a dog that's attracted to wild sights and scents; inclined to run, climb, swim, and dig; impatient to get in close for a good sniff; and happiest outdoors, on the trail etc. with his or her family. A dog like that can be attracted to almost any trap, and if the trap isn't dog-proof, the dog is likely to be injured or killed. If a trap is meant for catch and release (e.g. of the type used by trap-neuter-release (TNR) programs), the worst consequences for the captured animal can include hypothermia, tooth and gum damage, stress, and/or shock (these can be life-threatening). If it's a restraining trap or snare (e.g. a foothold trap, cable restraint, or in some cases an unpowered, locking neck snare), additional worst consequences can include depredation and/or the crushing, cutting, and/or tearing of tissues in the restrained limb--with potential damage to the skin, bone, tendons, circulatory system, immune system, and nervous system. If it's a lethal trap or snare (e.g. a body-gripping trap, spring-powered neck snare, or in some cases an unpowered, locking neck snare), the expected consequence is a relatively quick, but violent death. Traps are killing people's dogs! When the issue of dog injuries and deaths in traps was raised by groups including DogLovers 4 Safe Trapping MN, Sportsmen Take Action, and others in the year 2012, the Minnesota Department of Natural Resources (MN DNR) began to record "Trap Incident Reports." Although these reports are limited to incidents that are known to pet owners and are reported to the MN DNR, they're an important source of public information. Since then, from 2012 to 2018, the MN DNR has documented 31 Minnesota pets killed and 145 injured by traps (Table 1). Of course, these numbers are only the "tip of the iceberg," and each one is multiplied by the heartache of a family who, in too many cases, has lost their beloved pet. Each year the numbers accumulate, and each year the Minnesota Legislature is presented with a bill that would help to solve the problem. The bill would require all trappers to use lethal traps and snares in ways that responsible trappers do, already. It's time to pass that bill now! Table 1: A portion of the MN DNR Trap-Incident Report Summary, 2/26/2019. Injuries and deaths of MN pets in traps by year. Figure 1: A snapshot of the "injury or death" section of a MN DNR Trap-Incident Report. How much difference do cable restraints make for non-target animals? Cable restraints are a special type of snare. They're used to catch wild animals for the fur trade and predator control. They can improve animal welfare; and in many cases, give trappers the option to release their incidental catches relatively unharmed. The benefits for domestic dogs can be tremendous. But how likely are trappers to risk the release of dangerous animals? In this article, the advantages of cable restraints over regular snares are examined in a range of scenarios from easy and safe to difficult and dangerous. In each scenario, different types of animals are released from cable restraints by different types of people. The advantages vary according to the scenario, from big advantages for most domestic dogs, to questionable advantages for the more dangerous wild animals. Conclusion: It's time for Minnesota to switch to cable restraints! The Wisconsin Department of Natural Resources (WI DNR) cable-restraint guide (Olson and Tischaefer 2004) recommends the use of a catchpole to release a dog that's prone to bite. However, it doesn't provide any instructions for how to release wild animals, at least some of which (e.g. wolves) must be more dangerous and difficult to release than frightened domestic dogs. "... we highly recommend the use of a catchpole (which is nothing more than another cable restraint on the end of a fiberglass handle). Place the noose of the catchpole over the dog's head and tighten it gently. Then pin the animal down and cut the loop on the cable restraint to release it. A pair of quality cable cutters should become part of your personal cable restraint equipment." An animal caught in a cable restraint is likely to afraid, stressed, injured, and still struggling. It would be dangerous for a trapper to approach an animal in that condition, and slip the noose of a catchpole over its neck. An unknown percentage of trappers would be reluctant to put themselves in danger that way. Rather than putting themselves in danger, an unknown percentage of trappers would kill the animal. Trappers who risk a release put themselves in danger twice: once when they put the catchpole noose over the animal's neck, and again when they remove the noose and release the animal. Rather than putting themselves in danger the second time, An unknown percentage of trappers would use the catchpole to strangle the animal into unconsciousness before releasing it. So, although cable restraints are widely promoted for the option they give trappers to release incidental catches "unharmed," it seems unlikely that, in dangerous circumstances, many trappers would be willing to risk that option to release dangerous animals (e.g. wolves). How many trappers, rather than take any risk, instead just kill the animal? How many trappers, willing to deal with a snared animal but not with an injured animal released from a snare, opt to strangle the animal into unconsciousness (possibly causing further injury or death) before releasing it? Cable restraint: a snare that's built and set to the specifications of the WI DNR cable-restraint guide (Olson and Tischaefer 2004). Purposes of a cable restraint: 1) to reduce the harm that's done to animals by the snares, and 2) to improve the chances of releasing animals from the snares relatively unharmed. Ideal calm-dog scenario: A dog is caught in a cable restraint while walking or hunting with his or her owner. When the owner finds the dog, the dog is calm and waiting to be released. The owner releases the dog, unharmed, by simply loosening the noose of the cable restraint with his hands. Ideal aggressive-dog scenario: A trapper finds a strange dog in his cable restraint, but the dog seems to be behaving aggressively. The trapper uses his catchpole to immobilize the dog, removes the cable restraint by loosening or cutting the noose, and releases the dog from his catch pole. Ideal calm-wolf scenario: A trapper finds a wolf in his cable restraint (which he might have set intending to catch a coyote or bobcat). The wolf is not trying to escape or attack the trapper. The trapper--taking extra care to stay out of the catch circle, keep a barrier between himself and the wolf, and station an assistant with a weapon to defend against a possible attack--uses his catchpole to immobilize the wolf, removes the cable restraint by loosening or cutting the noose, and releases the wolf from his catch pole. Ideal aggressive-wolf scenario: A trapper finds an aggressive wolf in his cable restraint. He's reluctant to risk a release. He calls for assistance, and his local fish & game officer comes to help. Together, they release the wolf. Unfortunate aggressive-dog scenario: A dog, struggling to escape the cable restraint, is injured or killed when the steel cable cuts into its neck or other body part (Rankin 2016). Unfortunate wolf scenario: A wolf, struggling to escape the cable restraint, is injured as the steel cable cuts into its neck. The trapper, reluctant to risk releasing the wolf fully conscious from his catchpole, strangles the wolf into unconsciousness before releasing it and retreating to safety. The wolf is further injured, or killed, by strangulation. Unfortunate careless-trapper scenario: A careless trapper finds an aggressive dog or wolf in his cable restraint. He's reluctant to risk a release or call for assistance. He's in a remote area, and he can tell by the lack of other tracks in the snow that he's alone, and that what he does won't be observed. Rather than take a risk, he kills the dog or wolf, and tosses its carcass in the brush. Unfortunate negligent-trapper scenario: A trapper neglects to check his cable restraints. An animal is caught in one, and is left to suffer (Snowdon 2016; CBC 2015). The animal is injured, deprived of water and food, exposed to the weather and predators, afraid for its life, and exhausted from trying to escape. Eventually, the animal succumbs and dies. For calm domestic dogs (easy to release), cable restraints are much safer than regular snares. For frightened, struggling animals (difficult and risky to release), cable restraints will be safer than regular snares in many, but not all, cases. For animals caught by careless trappers who didn't build, set, or tend their cable restraints as required, cable restraints won't necessarily be any safer than regular snares. Cable restraints aren't perfect, but they would be a big improvement for Minnesota dogs. It's time for Minnesota to switch to cable restraints! CBC. 2015. "Hay River, N.W.T., Dog Killed by Abandoned Wolf Trap." CBC News North. Hay River, Northwest Territories, Canada: Canadian Broadcasting Company (CBC). Olson, John F., and Rick Tischaefer. 2004. "Cable Restraints in Wisconsin: A Guide to Responsible Use." Wisconsin Department of Natural Resources, Wisconsin Trappers Association. Rankin, Eric. 2016. "'My Dog Died in My Hands' Says Owner of Pet Caught in Snare Trap." CBC News. February 2. Snowdon, Wallace. 2016. "Coyote Snares a 'Death Trap' for Pets in Parkland County." CBC News. February 15. Diagram of a cable restraint (figure 41) from "Cable Restraints in Wisconsin: A Guide to Responsible Use." Olson, John F., and Rick Tischaefer. 2004. WI DNR, WTA. Don't you know your voice is stronger as part of an organization? Yes, but I also need to speak as an Independent. Why should MN switch from lethal snares to cable restraints? Cable restraints would be a compromise between trappers and animal-protection advocates. They're not perfect, but they can make a big difference for dogs! This note is meant to provide 1) information on snares, cable restraints, and their careful and careless use, 2) information about how animal suffering and accidental deaths might be alleviated by improved use of the devices in point 1, and 3) a call for a compromise to accomplish point 2. It's past time for Minnesota to follow the example of trapping experts and trappers in Wisconsin, and make the switch from regular snares and power snares to cable restraints. Protected animals (e.g. deer) are the "small-game" and "large-game" animals for which hunting and trapping seasons are regulated in order to provide recreational opportunities while maintaining healthy-sized populations, require relatively humane killing, and leave parents free to raise their young and live their lives relatively unhindered for most of the year. Non-target animals (e.g. parent animals with young waiting for them to return, endangered species, and people's dogs) are the animals that are caught in traps and snares by "mistake" (or shot by careless hunters who "thought they were coyotes"). Unprotected animals (e.g. coyotes, woodchucks, and skunks) are the unfortunate creatures that--either because they're more common, or less valued as game animals, or more valued for the off-season "recreational opportunity" they provide to hunters and trappers--are less protected in the ways they may legally be killed, orphaned, and exterminated. When careless hunters and trappers are caught killing non-target animals by "mistake," these are the animals they say they were after (and that excuse is generally accepted by fish & game officials and the courts). Regular snares are steel-cable nooses that are set along game trails to catch game or nuisance animals. In unskilled hands, they tend to be indiscriminate in the animals they catch, injure, and kill (Knudson 2012). Depending on how a captured animal struggles, and how the snare has been constructed and set, the animal is either killed quickly (which can be a mercy for a target animal or a tragedy for a non-target animal) or left overnight to suffer in misery (or longer in the case of a careless trapper). If the animal is not killed quickly, the snare is likely to inflict mortal wounds by constricting the blood flow to or from the head or appendage, and/or by cutting through the flesh. Snares maim and kill non-target animals in ways and numbers that would be shocking if they were not kept as "trade secrets" by trappers. Power snares are snares that are closed forcibly by springs (Bertram 1988). If their nooses tighten over vital organs, they're likely to deliver more rapid and certain kills. If they tighten over appendages, they're only likely to cause more misery. Again, a quick kill can either be a mercy for a target animal, or a more certain tragedy for a non-target animal. A non-kill with more severe wounding is just more misery. Cable restraints are snares with relaxing locks and other features including springs, swivels, breakaways, stops, and small, tangle-free catch circles designed to spare the lives of non-target animals and lessen the suffering of all animals in snares (Olson and Tischaefer 2004). In the right hands, they can be much kinder to calm, non-target animals (including people's dogs!) than regular snares or power snares. In the wrong hands, they're not likely to be worse. Second, a look at the regulations in other States. According to a tally kept by Born Free USA (Born Free USA, 2015), regular snares are prohibited in ten States, and restricted in another ten. Minnesota is not listed among the twenty States that have significantly regulated snaring. Minnesota's neighboring State of Wisconsin, however, is. Wisconsin has already made the switch to cable restraints on land (Olson and Tischaefer 2004). In Wisconsin, regular snares are allowed in watersets, but power snares are prohibited (WI DNR, 2014). And finally, a focus on Minnesota, in which the only significant restrictions on snaring are in the "farmland zone." In this central, southern, and western agricultural zone, snares on land are never allowed on public land, nor on road rights-of-way, nor on fences along road rights-of-way (MN DNR 2014). In the "farmland zone," snares are allowed on private land only from November through March (plus late October in the extreme northwest). Throughout Minnesota during the aquatic furbearer trapping seasons, snares of all types are allowed in watersets, because in responsible use, watersets are more selective--no off-season Fisher or Marten, no endangered Lynx, no people's dogs. It's time for Minnesota to make the switch from regular snares and power snares to cable restraints. Bertram, Bruce H. 1988. "Power Snare." http://www.google.com/patents/US5675928. Born Free USA. 2014. “State Prohibitions on Leghold, Kill-Type, and Snare Traps.” Born Free USA. http://www.bornfreeusa.org/b4a4_traps.php. Knudson, Tom. 2012. “Neck Snare Is a ‘Non-Forgiving and Nonselective’ Killer, Former Trapper Says.” Sacramento Bee, April 30. http://www.sacbee.com/news/investigations/wildlife-investigation/article2574607.html. MN DNR. 2014. Minnesota Hunting and Trapping Regulations Handbook. http://dnr.state.mn.us/regulations/hunting/index.html. Olson, John F., and Rick Tischaefer. 2004. “Cable Restraints in Wisconsin: A Guide to Responsible Use.” Wisconsin Department of Natural Resources, Wisconsin Trappers Association. http://dnr.wi.gov/topic/trap/documents/cableguide.pdf. Wiger, Charles W., and Peter Fischer. 2015. MN 2015 SF 592 / HF 1317: No Public Wolf Trapping, Baiting, Calling; No Snaring. https://www.revisor.mn.gov/bills/bill.php?f=SF592&b=senate&y=2015&ssn=0. WI DNR. 2014. Wisconsin Trapping Regulations. http://dnr.wi.gov/topic/trap/regulations.html. Figure 1: regular snare (with non-relaxing lock). Figure 2: RAM power snare. Figure 3: cable restraint (with relaxing lock). The other required components of a cable-restraint set (stops, breakaways, swivels, anchor) are not shown here. If I'm trapping legally, how can anyone say I'm doing anything wrong? This question comes up most often in the form of a statement like "He was trapping legally; he didn't do anything wrong." This statement is most often made after the trapper has done something terribly wrong to an animal--probably not on purpose, but more likely due to lack of knowledge, lack of skill, haste, or carelessness. Check out MN Trapping Ethics, think about it, and you'll probably come up with an answer to the question: "If I'm trapping legally, how can anyone say I'm doing anything wrong?" Can a dog's tongue be caught in a dog-proof raccoon trap? It depends on the bait, the trap, and the dog. It turns out that some of the dog-proof raccoon traps have two-way triggers, which is likely to make them less dog-proof than those with pull-only triggers. And of course, if the dog-proof raccoon trap is baited with something that the dog wants (e.g. meat, peanut butter, etc.) it's less likely to be dog-proof. As with all traps, care and discretion are called for to avoid harm to non-target animals. Corgi licking peanut butter out of a glass jar. Duke brand dog-proof raccoon trap (pull-only trigger is relatively safe). Take a look at this device (a #160 body-gripping trap laid over its upturned cubby with bait). If you don't know all of its parts, how they operate and tangle with the soft tissues and hard teeth of your dog (fighting against the trap and you for its life), then you're not prepared for a trap release and rescue. The trap-release instructions below (with acceptable ratings) can help you prepare to release a trap and save a dog, but (as you'll figure out once you start practicing with a reasonably-realistic simulation), the only sure thing is to avoid all areas in which these traps might be set. The goal of this page is to evaluate a few of the many available body-gripping trap-release instructions. Unfortunately, 1) too many sets of instructions have been published to be evaluated here, so this is not a complete list, and 2) most of the published instructions aren't practical, so this is just a list of their failings. The instructions that aren't practical tend to be political, and the reason there are so many is that there are so many political organization with statements to make in their own sets of instructions. Which of these instructions can dog owners actually learn from? The ones with good grades, or the ones that help us work out the method ourselves, through hands-on practice with various sizes of full-strength body-gripping traps, realistic dog models, and different release methods. If dog owners learn how to release these traps, can they count on saving their dogs? No. The instructions with the better grades are at the top, and the worst (the fake instructions that are actually political platforms) are at the bottom. Grade: A (very good), B (good), C (not bad), D (poor), F (failed). Intent of "political misdirection": in the critic's opinion, the apparent intent of the instructions is 1) to make the trap-release process seem easy, and thus 2) to make trapping regulations seem unnecessary (to protect people's dogs from lethal trapping & snaring in ways and in locations that could kill people's dogs). Shortcomings: one common shortcoming that applies to all of the following instructions is that they don't simulate a live dog struggling for its life or near death in the trap. For the worst instructions, the notation "too many [shortcomings] to list" will have to suffice in the summary (but is more detailed in the critical subtitles). A crew of four men releases a wolf from a foothold trap by immobilizing and isolating the animal under a utility sled. Intent: to show what "great guys" some trappers are. Shortcomings: not a body-gripping trap release. No evaluation of possible trap injuries. Strengths: a successful, real-life release. Trap set: dirt-hole set, intended to catch a wolf. Object in trap: juvenile wolf (released in order to reset the trap to catch an adult wolf). Release method: immobilization under utility sled. Title: "Trapper releases a wolf." Idaho Conservation League body-gripping trap-release video. Grade: A- (very good, but missing some information). Intent: public-service announcement (without getting into politics). Shortcomings: dog's head not covered, leash threaded from clasp end, only one trap--oversized. Strengths: appropriate warning of the danger of these lethal traps and the true difficulty of rescue. Trap: #330 body-gripping trap (oversized). Trap set: none (outdoors on the patio). Object in trap: beagle-sized dog model. Relatively small compared to the oversized trap. Host: ICL web page "Releasing Your Dog from a Trap or Snare" by John Robison, 10/11/2013. Footloose Montana body-gripping trap-release video. Grade: A- (good, but short on the danger of these situations, and long on the prospect of rescue followed by veterinary treatment). Intent: public-service announcement (with a comment on the opposition to the improvement of trapping regulations). Strengths: warning of the danger of the traps and the difficulty of rescuing dogs from them. Shortcomings: false comfort that through rescue and veterinary treatment, you may save your dog's life. Trap: #330 body-gripping trap (oversized, and thus in some ways easier to work with than the smaller traps that are more commonly encountered by dogs). Trap set: none (bare traps only, in a comfortable, indoor setting). Object in trap: Sheltie-sized dog model. Relatively small compared to the oversized trap, providing an unrealistic amount of room for the rescuer to work with. Inanimate model simulates the release of an unconscious dog: easier to release, but probably too late to save. Although the presenter calls for covering the dog's head (and teeth), the actual release is not shown with the head covered the dog restrained, or the trap anchored.. Title of Full Video: Trap Release Workshop. Presenter: Dave Pauli, Senior Director for Wildlife Response, Humane Society of the United States. Snapshot from the Wyoming Untrapped trap-release brochure (dog owners: take that warning in the lower-left seriously: "... a pet's survival is unlikely if caught..."). Intent: public-service announcement (including important references to the need for political change). Strengths: realistic warning of the danger of the traps and the difficulty of rescuing dogs from them. Shortcomings: the realistic warnings are unfortunately moderated by comforting indications that rescue and veterinary treatment "may save your dog's life." Trap: #330 body-gripping trap (oversized, and thus in some ways easier to work with than the smaller traps that are more commonly encountered by dogs). Foothold release diagrams show smaller, less-powerful, easier-to-release traps (wolf-sized traps require more strength or body weight). Trap set: none (illustrations only). Object in trap: drawings of a dog the size of a Shiba Inu. Relatively small compared to the oversized trap, providing an unrealistic amount of room for the rescuer to work with. The dog is shown unconscious: easier to release, but probably too late to save. Although the instructions call for covering the dog's head (and biting teeth), the illustrations show a placid dog with her head uncovered and unrestrained. Title: Trap Safety for Pet Owners. Contributors: Alaska Department of Fish and Game (see the critique of their video, below). Drawings by Sarah DeGennaro, copyright ADF&G. Host URL: http://www.wyominguntrapped.org/ with a link to the Non-Target Trapping Incident Database of Born Free USA. Alaska Department of Fish & Game body-gripping trap-release video. Grade: B (good, but incomplete physically and politically). Intent: trying to help hunters and trappers get along without trapping regulations? 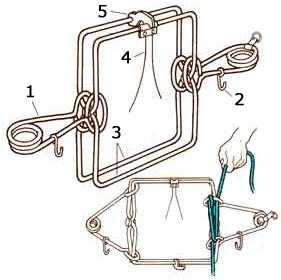 Shortcomings: 1) the dog's head wasn't covered; 2) only one trap was demonstrated (of the largest size, and the easiest to thread a leash through); 3) although the importance of not moving the trap was stressed at the beginning, the trap was lifted as the leash was pulled to release each of the two springs; 4) of course, the demonstration was done on an inanimate model rather than on a real, living, struggling, screaming dog, caught in the lethal grip of a body-gripping trap. Strengths: 1) appropriate warning: "you'll have to move very rapidly" to get your dog out of the trap alive; 2) reliable "twice around with horizontal pull" leash method; 3) an accompanying pamphlet provides the information in print, as an alternative or a backup to this video. Producer type: trapping lobby and State Fish & Game Department. Trap set: none (indoors on the floor). Object in trap: beagle-sized wolf model. Unrealistically small in the oversized trap. Release method: leash "twice-around with horizontal pull." Producer: Alaska Dept. of Fish & Game and the Alaska Trappers Association. Host: "Sharing the Trails" pamphlet and video series. Idaho Dept. of Fish & Game (IDFG). Idaho Department of Fish & Game trap-avoidance video. Grade: B (presents good information, but with a political subtext: "dogs should always be leashed; trappers are not liable"). Intent: to help urban dog owners accommodate to trappers, while freeing trappers from any responsibility for harming or killing people's dogs. Shortcomings: only helps dog owners when they have their dogs on leash. Strengths: helps dog owners avoid traps. Trap: foothold and body-gripping traps in a variety of sets. One snare is pictured, but snares are not otherwise shown. Trap set: several sets are shown accurately in natural settings. Object in trap: none--this is a trap-avoidance video, not a trap-release video. Release method: none--this is a trap-avoidance video, not a trap-release video.. Title: Recognizing & Avoiding Wildlife Traps while Walking your Dog. Talent: Jennifer Struthers, Wildlife Biologist and model. Producer: Idaho Dept. of Fish & Game. Host: Idaho Dept. of Fish & Game. Scott Slocum's body-gripping trap-release video. Grade: B (good, but focused on complications--of intentionally-limited instructional value). Intent: public-service announcement (including politics). Shortcomings: model's head not covered, no close-ups to show details of the release technique. Strengths: warns of complications that can interfere with or prevent rescue. Trap: Duke #160 body-gripping trap. Title: Dogs & Traps #4 excerpt: release demo. Pioneer Press body-gripping trap-release video. Grade: C (not bad, but incomplete physically and politically). Strengths: rejects "manual" method, endorses "belt" or "leash" method. Object in trap: bulldog-sized model. Realistic. Release method: belt (variation on the "leash" method, requires a flexible belt). Title: Dog trapped in a trap for wild animals? Here's how to get it out. Talent: Dave Orrick, Outdoors Editor. Host: Pioneer Press article "How 7 inches can save a dog's life" by Dave Orrick, 10/20/2012. Video URL: (see host URL). Location: Saint Paul, MN, USA. Terrier Man's body-gripping trap-release instructions (print). Shortcomings: a shoestring is not as reliable as a leash. Strengths: warns of danger, shows details of trap and how to thread the rope through it. Trap: generic body-gripping trap (no scale). Trap set: none (diagrams only show empty trap). Release method: shoestring, leash, rope. Title: Releasing Your Dog From a Trap: Be prepared for the unthinkable -- it could save your dog's life! Talent: "Terrier Man" Patrick Burns. Fur-Bearer Defenders body-gripping trap-release video. Intent: Fundraising? There's actually a fundraising link on the host page. Producer type: animal-protection organization (for some reason, off-track with this video). Trap set: none (indoors on floor). Object in trap: none. Totally unrealistic. Why do people (and good organizations like this) keep making "comfort videos" like this? The video of how to open an empty foothold trap on a carpeted floor can only give people false confidence in how easy they think it will be to encounter a trap in real-life, with a struggling, biting dog in it; a stake holding it down; and possibly a wet and muddy surface on which "just stepping down on the trap springs" will not be an option. And if it's a lethal trap? Now that they've got all of that false confidence built up, about how easy they think it will be to encounter any trap, they might not think they need any more skills than the ones they imagine they have already. In real life, dogs who encounter lethal traps and snares are generally killed, even when their owners are present. If you're going to make an honest instructional video, you need to have at least a simulation of a struggling, biting dog; a stake holding it down; and possibly a wet and muddy surface on which "just stepping down on the trap springs" will not be an option. You need to have an average person discovering that he or she doesn't have the strength, leverage, timing, or training enough to release the powerful springs of a body-gripping trap, or the spring of a power snare, or the lock of a non-relaxing snare. You need to have a veterinarian recount cases of damage to dogs' throats or spines that was caused immediately as the lethal traps and snares closed on their vulnerable neck tissues. If you're going to take down a trivialized and misleading instructional video, please start by taking these two down. I've "graded" some instructional videos better and worse than this, but unfortunately the poor ones keep showing up as each trapping association and State game & fish agency scrambles to present trapping in a good light, or tries to look like it's being helpful, or tries to help but doesn't try hard enough to do their research, or whatever the problem is. We don't need any more, but it looks like we're still getting them. Title: "How to release your dog from a conibear trap." Producer: Fur-Bearer Defenders (Association for the Protection of Fur-Bearing Animals). Scott Linden Outdoors body-gripping trap-release video. Grade: F (failed, fictitious, fake). Shortcomings: too many to list--see critic's comment on the YouTube video. Trap set: none (indoors on a table). Release method: 1) by hand, 2) rope. Host: Field & Stream article "Learn How Traps Work: It Could Save Your Dog's Life" by Chad Love, 2/2/2012. MFZTA body-gripping and foothold trap-release video. Shortcomings: too many to list--see the critic's video subtitles. Trap: #220 body-gripping traps (plus coilspring and longspring foothold traps). Trap set: blind trail set, cubby, recessed cubby (foothold sets not shown). Object in trap: cardboard tube. Not a good model. Release method: 1) by hand, 2) setting tool, 3) cable ties (footholds: by hands or feet). Title: Trapper Education, Non-Targeted Animals. Talent: Dan and Jean Bergerson. Star Tribune body-gripping trap-release video. Strengths: trail set shown in nature (hidden), "setting tool" and "cable-tie" alternatives introduced. Trap set: none (trap never even triggered). Host: StarTribune article "Hunters upset after dogs killed by traps" by Doug Smith, 1/24/2012. Grade: F++ (Nearly as bad as the Wisconsin Trappers Association (WTA) trap-release instructions, below). The two "plus" signs are added to the still-failing grade because the TrapFree Oregon web page and brochure add photos to supplement and correct the poor-quality WTA diagrams of "the rope trick!" Producer type: animal-protection organization (for some reason, off-track with these instructions). Title: How to free your pet from a body-gripping trap. Wisconsin Trappers Association (WTA) trap-release instructions. Grade: F+ (Nearly as bad as the Minnesota Trappers Association trap-release instructions, below). Title: How to remove your pet from a body-grip trap. Producer: Wisconsin Department of Natural Resources and Wisconsin Trappers Association. Host: Wisconsin Department of Natural Resources. Date: since at least 2005. Minnesota Trappers Association (MTA) trap-release instructions (in print only). Shortcomings: too many to list--see the critic's written review. Trap set: none (diagrams show only the trap and dog). Object in trap: larger-size dog. Realistic in size. Suitcase capture--less pressure on dog's neck. Critique URL #1: Why are there fake trap-release instructions in the MN Hunting & Trapping Handbook? Critique URL #2: My experience with the MTA / MN-DNR trap-release instructions. Title: How to release a domestic animal from a body gripping (raccoon) trap. Host: MN Hunting & Trapping Regulations Handbook. Paid advertisement. Handbook URL: (indexed at the host URL). Date: since at least 2007.